Have you got your (Roll)maal yet? - CHOMP! SLURRP! BURP! Have you got your (Roll)maal yet? Customised rolls with a variety of breads and meats and flavours from across the country, desi snack options and fusion fries. This Rollmaal outlet has been my go to place ever since I have moved to #Gurugram. 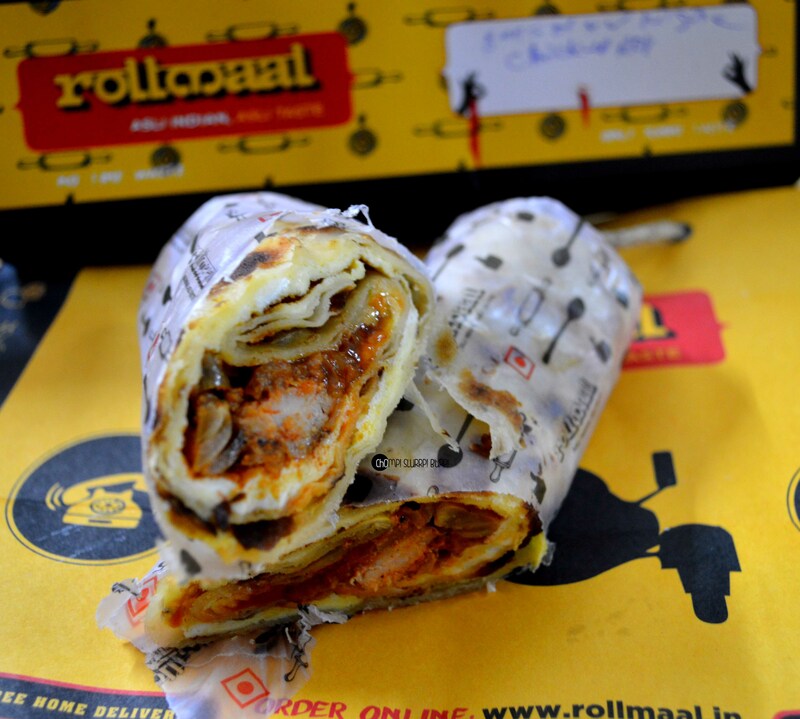 Located at Sector 15 market, Rollmaal shares the space with SpeedyChow (which is next on my hunger pangs list). The outlet is brightly done with white brick walls, frames, graffiti and colourful metal chairs. Kali mirchi chicken tikka roll with ulte tawe ka parantha. A well done crispy parantha generously stuffed with succulent Kali Mirch chicken tikka. Chicken 65 roll with Malabar parantha – a truly appetising delicacy from Hyderabad. A soft, layered parantha with fried, flavoursome chicken 65 complete with curry leaves. They also serve combo meal with masala fries and Roluu’s remix, an in-house desi mocktail which was a real thirst quencher. They have also introduced a number of new rolls including the hot seller – Bengali chicken roll. A classic kathi with spicy chicken and a soft fluffy egg. Much like the kathi rolls you get on the streets. Kebab and parantha – dilli ka chicken tikka with ulte tawe ka parantha. I love it that the meats are always, always so fresh here. And this too was a portion of fine, succulent tikkas with so many masalas and yumminess. The proportion however of the parantha and tikka was a minus point. Their butter chicken was another recommendation which I ordered in. The package came nicely packed and steaming hot. The butter chicken gravy could have been thicker and the otherwise juicy chicken pieces could have definitely been more. So head to an outlet near and grab your maal! No, I haven’t had my roll mask yet. But chicken 65 with malabar paratha has got me interested.